Great Idea from DreamBigs site, a nice way to discover wonderful new talent and meeting people. I still feel I am new to the world of writing, blogging and reviewing. But I have found many like-minded writers and look forward to discovering more. By the time you read this I will have been on the road for several hours!! We have talked recently about the importance of networking and meeting new people, so here’s your chance. Feel free to leave a link to your blog post or page and a little info about yourself in the comments and then reblog! Great way to network. For those of my readers that are not bloggers take a few moments and scan the links in the comments as there are so many talented writers on WordPress. One of my favorite things about WP is it serves as a social platform allowing me to discover so many talented individuals! What an amazing thing to do from an amazing blogger that I am pleased to read regularly! Thank you AB for the kind mention. This is dedicated to all of you my diehard readers/serial likers/skimmers/supports and general passerby bloggers. Thank you so much, you have been given AB’s Awesomeness Award, You are amazing, you deserve lot more in life and it will be yours, keep trying. I don’t want to embarrass you all by names, but you know who you are. I also nominate you for all the wonderful awards I have got so far, you all deserve this. I thank you all again for just making my life amazing. Stay blessed and keep smiling. Calling All Writers!! Up-coming Short Story Competitions. The first one is FREE to enter. It has a theme of ‘Summer Loving’ and there is a maximum of 1,200 words in which to tell the story. The closing date is 27th August 2015 and the judge is Andrew Campbell-Kearsey, author of more than 100 published short stories. The winner will receive Andrew’s book ‘Centurionman‘, one free entry to the Erewash Open Short Story Competition 2016 plus online publication of the story on their website and Facebook page. Full competition details can be found here. In 1929, he wrote MEET THE TIGER, the first Saint book. MEET THE TIGER sold very well, and soon the follow-up adventures of Simon Templar were making Charteris famous and rich. His style of telling a story was very breezy, fast-paced and exciting, and the Saint has always held the fascination of readers. The character has appeared in movies in the 30s & 40s, on radio, in comic strips and on television. A new generation was introduced to an updated version of the Saint n the movie starring Val Kilmer. 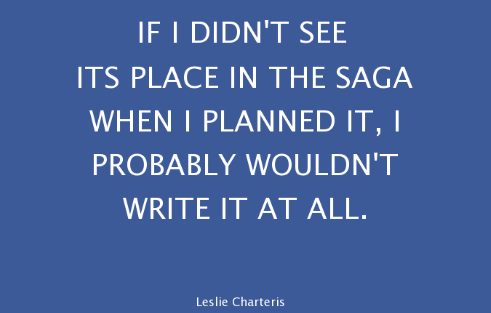 In the 1940s, Charteris, besides continuing to write The Saint stories, scripted the Sherlock Holmes radio series featuring Basil Rathbone and Nigel Bruce. Charteris’s father claimed to be able to trace his lineage back to the emperors of the Shang Dynasty.